Detect and manage the settings of all AuviTran devices, as well as some other manufacturers. Remote monitoring of audio channels (up to 895) in mono, stereo and 5.1. Equipment monitoring with alarm history. Supervision and easy configuration of networks (AxC-SWD5G) with a page to configure your VLANs, redundancy etc …. Easy clock configurations on different networks with the possibility of several master clocks (AxC-DX4I / AxC-ADSP / AxC-DS32IO boards) on same networks. Tunnel control MADI over DANTE. Signal Processing, Trim / EQ / Comp / Delay. (AxC-ADSP & AVDT-BOB). AxC-AX4M card configuration for remote control on RIO or AD8HR mode. Integrated firmware manager for AuviTran equipments. Import / export of devices and network architecture. Last stable release : V6.22.00 (r6827) released on April, 2019 . Evolution: Add new features for AxC-Dante. Evolution: New Dante API with DDM. Evolution: Integrated firmware management.List of available packages. Evolution: Add backup and restore settings management for AVDT-BOB and AxC-DSP. Fix IHM freez on firmware update if Dante device locked. Fix: Network interface not show on Control Panel. Fix: Shutdown AVS-TFTPServer on new installation. AuviTran Network ASIO Streamer provides play functionnality of multichannel high quality audio to any EtherSound device, and it can record too! This new feature is available on all new AVY16-ES100, AVM500-ES and AVM500-ES/3ports devices. With multistream capabilities, you can play and record on 8 devices simultaneously. Don’t remove configuration on update mode. 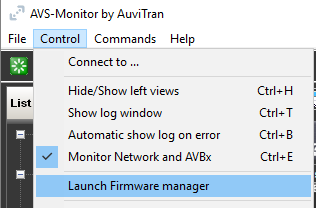 AVS-Firmware Updater is now integrated into the AVS-Monitor software. Fix critical bug if length of Dante device name < 4 characters. Fix on flash partition management for firmware update. Warning : if updating AVDT-BOB from version 2.022, an error message will display at the end of the update. This message should be ignored, and device can securely be rebooted to run on the new firmware. 4 Dante inputs named “Dante In1” up to “Dante In4“ are coming from Dante network via the Gigabit Ethernet Main or Aux ports. 2 to 4 analog Line outputs named as “Out1”, “Out2”… are connected to Line Out connectors. 4 Dante outputs named “Dante Out1” up to “Dante Out4“ are sending to Dante network via the Gigabit Ethernet Main or Aux ports. 4x Equalizations plus Limiter Compressor plus Noise gate processing can be assigned to 4 inputs (i.e. Mic/Line or Dante inputs). 8x faders allow to manage the Mic/Line preamp gain and digital Dante input gain. Each input can be enabled or muted and inverted. 48V Phantom power can be set individually to any Mic/Line input. The Mixing Processing block manages 4 independent Master mixers that are sent to the Output Processing Block. Each Master mixer can mix up to 8 inputs (i.e. the Mic/Line and the Dante processed inputs) via individual faders controlling the input mixing gains. Each input of a Master mixer can be enabled or muted. Each mixer has an Master fader controlling the Master mixer output level. The Output processing block manages up to 4 analog outputs and the 4 Dante outputs. The source of any output can be selected between one of the 4 Mic/Line DirectOut or the 4 processed inputs (Mic/line and Dante) or the 4 Master mixers. 4x Equalizations plus Limiter Compressor plus Noise gate processing are available on the 4 analog outputs. 8x faders allow to manage the output gains. Each output can be enabled or muted.